There is a movement in Chen Pan Ling taijiquan called "left single whip". It leads to a sequence known as "raise arm and step forwards". These movements seem very weak and soft - yet they contain within them concepts of "softness overcoming hardness" that can make your mind spin. As far as I'm concerned, they are as close as you get to something "mystical". It's really just simple mechanics. But who would have thought those mechanics would be quite so powerful! Part 1 was filmed last week. It shows a performance of the part of the form I'm talking about. Part 2 was filmed this morning. I do the applications slowly (mostly). But in reality, they are, of course, done fast. Both videos involve some aspect of "stand up grappling" - which will no doubt surprise some folks given my last two articles. I make it clear that I am an ardent practitioner of stand up grappling - I just believe that you need to approach it carefully in order to minimise the chances of being trapped into a grappling game and taken to the ground. This is especially evident in my most recent video which involves a throw application. 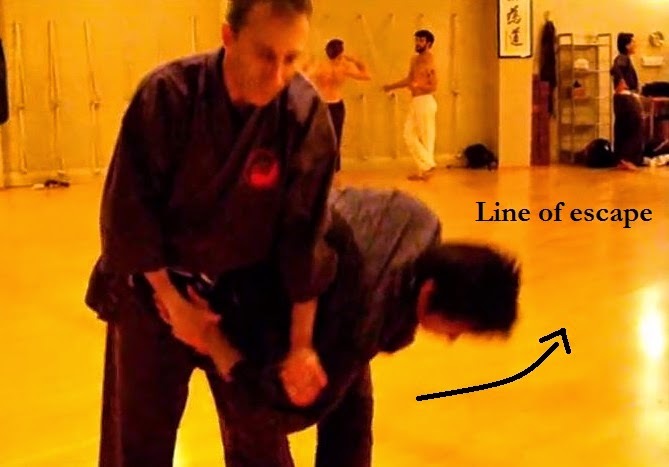 I like this throw because it demonstrates how good technique and structure create inherent strength: even if the partner is being an absolute pain and resisting it every step of the way in a slow demonstration, you still win. A large part of the "structure" involves the maintenance of a "C" back shape which I have previously discussed. When done with force/speed, the throw is much easier. When preceded by a "softening blow", it's even easier. This is about the only time you should be attempting some form of throw, lock or other stand up grapple in civilian defence: the lever should work even when fully resisted in slow motion. Then you don't have worry about using brute force to cover up bad technique. Besides - there's a good chance your technique will be off when you're under pressure: you need a margin for error. Contrast the above with the "tricep lever" throw I discussed in my last post and you'll see what I mean about tempting fate with such a sub-optimal technique. The "left single whip throw/projection" happens to be one of my favourite throws - because it actually works in unscripted sparring. And I rarely get dragged down with my partner. What I love about the techniques in both videos is that they work entirely on "softness" - which is what makes them seem "mystical" or "qi powered". Of course, that softness is all about exploiting your opponent's lines of least resistance and maximising yours. In particular I like to use the throw in the second video as a kind of test of whether you're able to use your whole body momentum in a synergistic way. One millisecond out of time, one millimetre out of alignment and it doesn't work. This is precisely the sort of "advanced" internal arts technique I spoke of years ago. It's hard to get right, but when you do - boy, it's good stuff!